A new bar/restaurant offering popular German food and 30 different types of beer on tap opened recently near the Queens Center Mall. 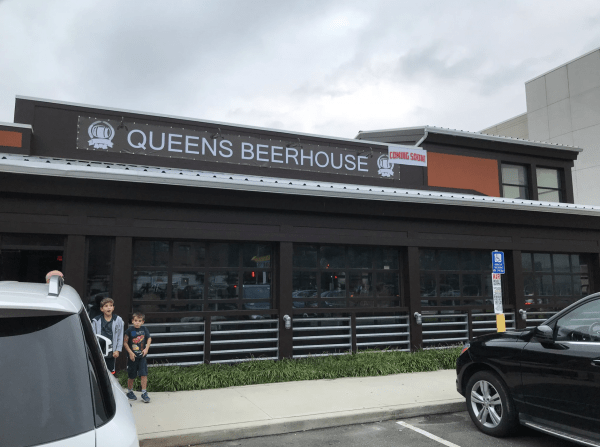 Queens Beerhouse, located at 92-50 59th Ave., has taken over the 8,500 square foot venue that was previously occupied by Joe’s Crab Shack. The establishment offers Jumbo Oktoberfest Pretzel with beer cheese dip; a German Sausage Sampler with four flavors of German sausage; the Queens Beerhouse Burger with house sauce; and a Dutch Baby, or German pancake, that it serves for brunch on weekends from 10 a.m. to 3 p.m. The establishment offers a happy hour each weekday from 4 p.m. to 7 p.m., which includes $5 food specials for items as fried pickles, sauerkraut balls and Flammkuchen flatbread. Well drinks during happy hour are $5 and there is $2 off draft beers. The establishment focuses heavily on beer. Last month, it held a “Beer Mug Holding Contest,” where the winner who held the mug the longest took home $200. Queens Beerhouse is open Monday-Thursday from noon to midnight; on Fridays from noon to 2 a.m.; Saturdays from 10 a.m. to 2 a.m.; and on Sundays from 10 a.m. to midnight. The establishment has a private parking lot. How do you compete with Zum Stammtisch in Glendale, Queens? I wish the place success because that is jobs and tax payers in the neighborhood. But I question the location because similar businesses have come and gone in that area like Outback steak house, and even the Mcdonalds on the corner of Quees Blvd. Restaurants have trouble around there. Give the place a chance. Queens is the most diverse community in the country. Why not have German food too. We had loads of it years ago. Fyi German food includes currywurst which is like a sausage with curry. There are people out there who will come. Can’t wait to try it. I’m excited… sounds great! Hope it’s successful! im kinda excited there is something different in the area and hope this place gains more popularity but it’s gonna be tough in the beginning. Good luck, but would be better attract more people with a combination Beer Hall, Pollo’s Mario type rotisserie, Taqueria, Rice & Beans Place with carne asada, fried yuca and pizza pies, empanadas, large portions at affordable prices would attract families, kids, with an arcade, etc. That’s sounds exactly like something the area doesn’t need. The area doesn’t need you either but it tolerates a hater like you..
Yeah, it’s called a food court and the Mall already has one! I wish them well, but the demographics are not interested in this type of cuisine. These lager-slurpers have a snowball’s chance in H*ll. They’ll soon be following Joe’s Crab Shack into the bottom of the sea. This looks like a hipster wanna be place(ie $5 for a pickle). I don’t know if this area is ready for it. Most of the hipster places in queens/Brooklyn are on the east river coast, LIC, Greenpoint, Billyburg etc. If the food is good it can work. That Joes Crab Shack was the worst one I ever went to.